Maybe it was the greed or a need to sweep political embarrassment under the proverbial rug. Perhaps it’s simply an old Indian curse on those foolish enough to disturb a sacred burial site. Whatever the reason, this cemetery has suffered a century’s worth of indignities including abandonment, foreclosure, bulldozing, and housing development. And what began as a five acre cemetery plot, now remains a mere 2.3 acre knoll languishing between a multitude of single family homes. It’s a story almost too strange to be true. Comet Lodge Cemetery was a Duwamish Indian burial site long before actual land ownership passed to the International Order of Odd Fellows in 1895. Offering fine hilltop views of south Seattle, it seemed a pleasant resting place for those early settlers such as Emma Rigby, one of area’s first female doctors. But peace reigned for only twelve years. In 1905, a booming population, plus a need for more residential housing tract land, caused the City of Seattle to move 700+ bodies from the county pauper’s cemetery to an undisclosed location in south Seattle. No transfer records seem to exist but it’s generally assumed the new burial location was the Odd Fellows Cemetery as the site became known as the Georgetown Potters’ Field. Over the next two decades, the Odd Fellows Council began selling off specific parcels to individual members who then re-sold the plots, regardless of whether they were occupied. One local enthusiast told the Seattle Post-Intelligencer that his master’s thesis research had revealed the cemetery had even been split in half in 1908 to accommodate the building of eleven new homes. In 1927, land records show the City of Seattle purchasing portions of “Baby Land”, a section of the cemetery devoted specifically to young children and infants. No records of disinterment can be found but this portion was later zoned and developed for residential housing. The Odd Fellows Council finally dissolved in 1931, abandoning cemetery upkeep responsibilities to the families of those buried at the site. Initial attempts were made to keep the cemetery cleared but sheer size proved overwhelming. The cemetery fell into disrepair and headstones became trapped in a mass of blackberry bramble overgrowth. 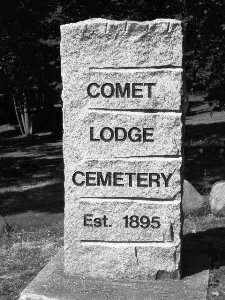 I am researching king county cemeteries and have just begun to look into comet lodge -do you have any suggestions in reference material? there seems to be alot of movement of the dead in ealy 1900’s seattle?! any pointers would be great and thanks for this posting! Yes, Comet Lodge is a very interesting site for researchers. I’d suggest starting with the links in the article and then talking with the reference librarians at Seattle Public Library. They can direct you to more original sources (plat maps, history books, etc.,) from there. Good luck! The blogspot page is a good entry into hundreds of pages of documentation that I have gathered since doing my studies at SU on this cemetery restoration. The City and County continue to desecrate and deny most of the graveyard’s existence, all the while denying any pleas from those living atop the cemetery grounds. I welcome any input you might have to offer. I believe that my great-great grandfather was buried in this cemetery in 1905. We are establishing a family cemetery and would like to bring “home” the headstone, provided that one existed. Do you have any info about headstones or way I may find out more info about his gravesite. His name was Griffin Skinner Crawford. There are only a few headstones left in the cemetery but it’s certainly worth a visit to see not only if his is there, but also to get a better understanding of what’s happened to the site. If you visit, I’d also suggest coordinating a visit with a trip to the Seattle Public Library to talk with the genealogists. If you can’t, then just give them call – they’re very helpful and can direct you further. I’d also check otu John Dickinson’s blog. (the one listed below) to see what else you can find. Best of luck and please let us know what you find. Have you found Griffin Skinner Crawford? Griffin is my 3rd GGF. He was born Aug 1829, in Bradforn, PA & died 3 Apr 1906 in Seattle. He was married to Elsie Marie Clark. Would love to find his plot. Your history of the Comet Lodge Cemetery is well written.